Band of Outsiders serves as the perfect introduction to the work of the seminal artist credited here as “Jean-Luc Cinéma Godard.” The film puts the leading New Wave director’s love of B-movies and detective novels front and center, with the story of a heist carried off by the unlikely trio of two shiftless Paris guys and the moony au pair they both love, but is at its most exhilarating with its famous “digressions”: the legendary line dance in a Paris café or the whirlwind trip to the Louvre, in which the trio break the record for the fastest museum visit. Along with this constant playfulness, the film’s mix of youthful ebullience and romantic tragedy, its interplay between the gritty black and white images of Paris and Godard’s poetic voiceover, and the thrilling moments in which the camera seems to break with the narrative to capture the young actors’ very essence create a particularly enjoyable primer in the art of the New Wave, as well as Godard’s most accessible film. Made as a gift to his wife and muse Anna Karina to help her out of a period of depression, Band of Outsiders has a buoyancy that would soon be replaced by the sharper critique and harder edges of Godard’s political films of the late sixties. Also starring the boisterous Claude Brasseur and intense Sami Frey, Band of Outsiders is an unforgettable ode to youth, Paris, and cinema. 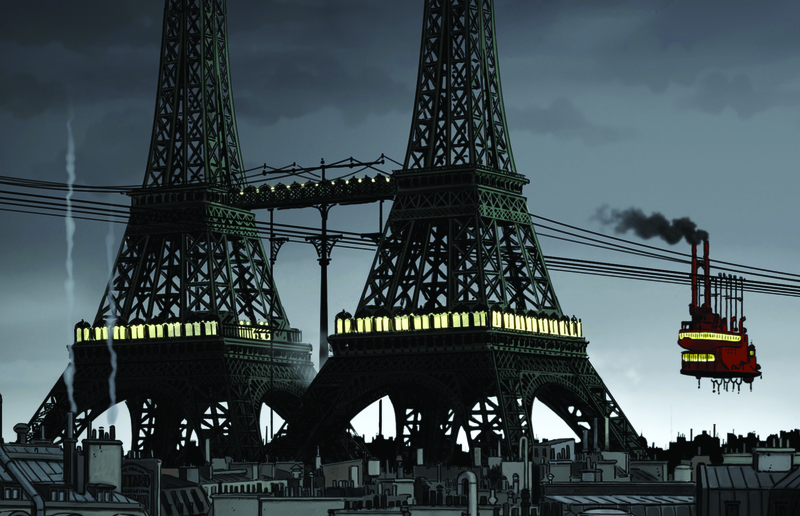 This one-of-a-kind animated adventure film ushers the viewer into an alternate reality in which the Bonapartes still rule France, electricity was never discovered, trees are a distant memory, and a steam-driven cable car connects Paris to Berlin. In this dystopic steampunk landscape, scientists have mysteriously disappeared for decades and April Franklin, the brilliant young descendant of a long line of chemists is in danger of being next. With the help of a shady drifter called Julius and her talking cat Darwin, April sets off to find her missing parents, while trying to keep the “invincibility serum” she has developed out of the hands of the imperial police—and those of a nefarious group of intelligent Komodo dragons! Based on the unmistakable blend of urban grit and historical fantasy found in the drawings of Jacques Tardi, one of France’s most influential graphic novelists of the last half century, April and the Extraordinary World is not only an engrossing, wildly imaginative entertainment for the whole family but a slyly feminist statement, an ode to science, and an earnest plea for world peace. 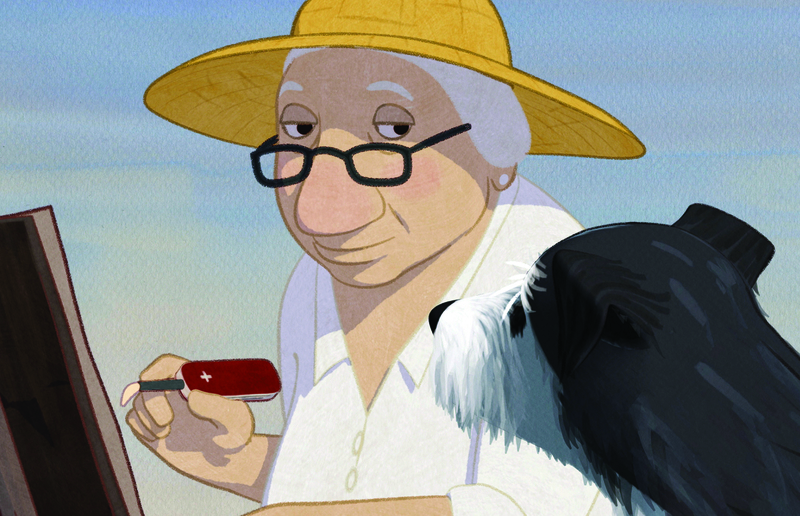 It is also one of the finest showcases for the visionary work being done in contemporary French animation. 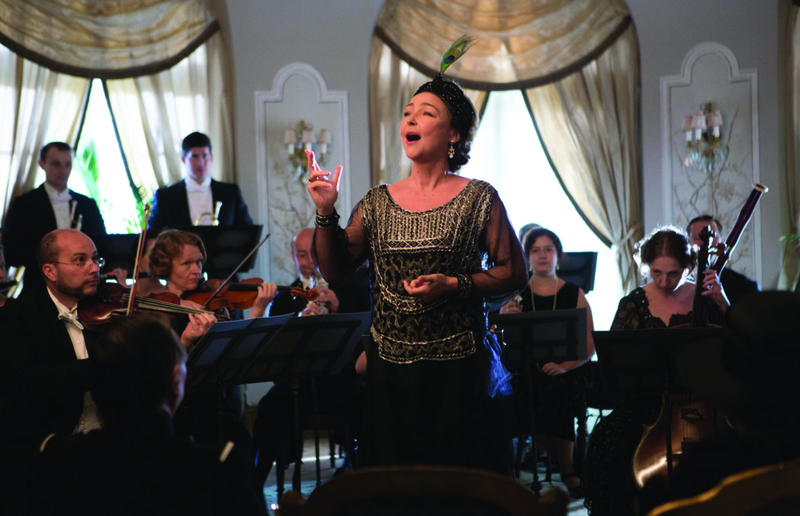 Marguerite Dumont is an incredibly wealthy woman who has devoted her life to singing opera. There’s only one problem and it’s a problem no one will dare to mention to her, starting with her husband: she cannot sing in tune to save her life. From this brilliant premise based on the true story of Florence Foster Jenkins, the American socialite and calamitous singer who inspired the recent Meryl Streep film (and a character in Citizen Kane), writer-director Xavier Gianolli draws a marvelously rich tale, mining the comic possibilities as well as the genuine tragedy of a woman living in a world of illusion sustained by sycophants. Gianolli also creates a striking portrait of Paris in the twenties, taking in the aristocratic milieu as well as the ferment of subversive art movements and the Bohemian demimonde. Marguerite is a tour de force of controlled chaos, brimming with eccentric characters and opulent set pieces, all orbiting around the irresistible figure of Marguerite, a woman whose dedication is an inspiration—until it turns to madness and cautionary tale. For her unforgettable performance in Marguerite, Catherine Fort was awarded the 2015 César (French Oscar) for best actress in a leading role. When elderly widow Louise misses the last train out of the seaside resort she usually summers in, she finds herself stranded in a ghost town of empty buildings and waxing and waning tides. She soon becomes a genteel Robinson Crusoe, building a hut on the beach and settling in with a raggedy talking dog and the memories of her childhood. A rare example of animation primarily aimed at an adult audience, Louise by the Shore has been compared in the pages of French film journal Cahiers du Cinéma to an episode of The Twilight Zone revisited by Jacques Tati (with a hint of Proust for good measure). But this offbeat gem is truly one of a kind and a welcome reminder from French veteran Jean-François Laguionie that animation can be a medium for quiet lyricism and characters rarely given center stage in live action film. Voiced by French theater star Dominique Frot’s scratchy, measured singsong, with an evocative soundtrack of solo piano and occasional choral music, Louise by the Shore is a delightfully tranquil meditation on solitude and the passage of time, a profound antidote to the twenty-four-hour news cycle and other contemporary torments. It is animated using an innovative combination of traditional 2D animation and digital imaging to create the effect of gently but constantly shifting watercolors, perfectly suited to this poetic fantasy of offseason life by the sea. Writer-director Philippe Faucon’s long-running project of making films about those members of the French population traditionally left off-screen reaches a state of grace in Fatima, perfectly balancing sharp observation of the harsh realities of the immigrant experience with an inspiring story of individual resilience. Fatima is a middle-aged, divorced Algerian woman living in a French suburb, cleaning houses and offices from dawn to dusk to provide her spirited teenage daughters with a better future. It takes a workplace accident for Fatima to finally pay attention to her own needs and discover a powerful means of expressing them through poetry. Working with tremendous economy, Faucon brings the eye of an anthropologist and the feeling of a true artist to a story that touches on a variety of essential issues: everyday racism, illiteracy, the challenges of the French university system, and the clash between traditional, older immigrant generations and their assimilating children. Loosely based on a true story and featuring a superbly crafted, stoic performance by real-life cleaning lady Soria Zeroual, Fatima was awarded the French film industry’s two highest distinctions for 2015, the Prix Louis Delluc and the César for best film of the year. Though bravely realistic, Swiss director Claude Barras’s charming stopmotion animated film is an unexpectedly uplifting look at childhood tragedy. After his alcoholic mother’s death, nine-year-old Icare—known to his friends as Zucchini—is placed in a group home where he soon forms alliances and rivalries with a group of kids in equally difficult circumstances, including the son of drug addicts and the daughter of a deported refugee. But it takes the arrival of the recently orphaned Camille for Zuchini to know he has found a friend for life. Which means that when Camille’s nasty aunt appears to take her away, the kids band together to find a way to keep her at the home. Though Barras and screenwriter Céline Sciamma (a powerhouse of contemporary French cinema as the writer/director of international hit Girlhood) never pull punches in describing the challenges faced by their characters, My Life as a Zucchini is imbued with a real-life sense of childhood wonder, both through its inventive animation and its commitment to exclusively telling the story from the children’s perspective. The result is a marvelously nuanced, finely crafted depiction of childhood, as appealing to young people as adults. 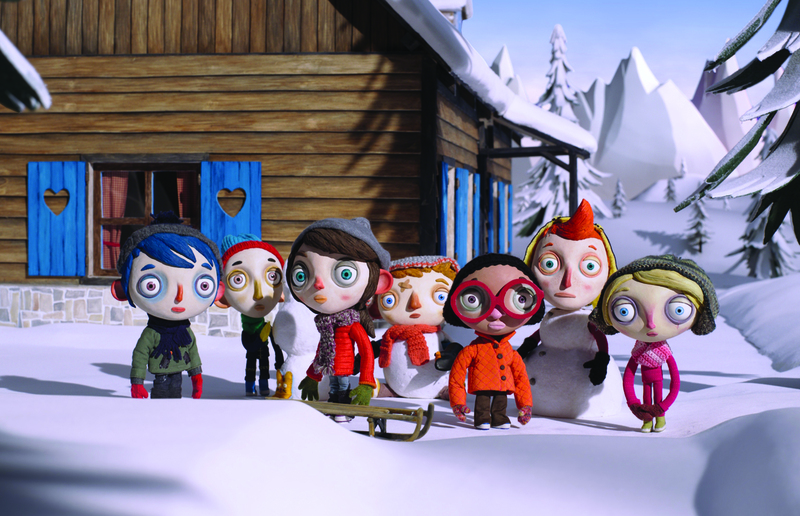 Following a triumphant premiere at the Director’s Fortnight at the Cannes Film Festival, My Life as a Zucchini wooed general audiences in France with its idiosyncratic style and bold treatment of its subject. It has since been nominated for a 2017 Academy Award for Best Animated Feature. Sponsored by the Department of Modern Languages & Cultures, the Film & Media Studies Program, and FACE Tournées Film Festival. The Tournées Festival is made possible with the support of the Cultural Services of the French Embassy in the US, the Centre National de la Cinématographie et de l’Image Animée, the Franco-American Cultural Fund, the Florence Gould Foundation, and highbrow entertainment. For information on the Fall 2016 Tournées Film Festival, click here. 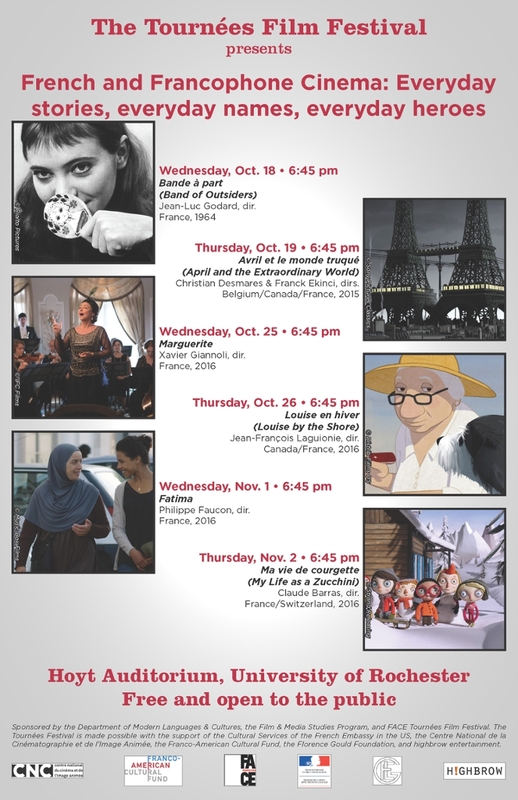 For information on the Fall 2015 Tournées Film Festival, click here. For information on the Spring 2015 Tournées Film Festival, click here.